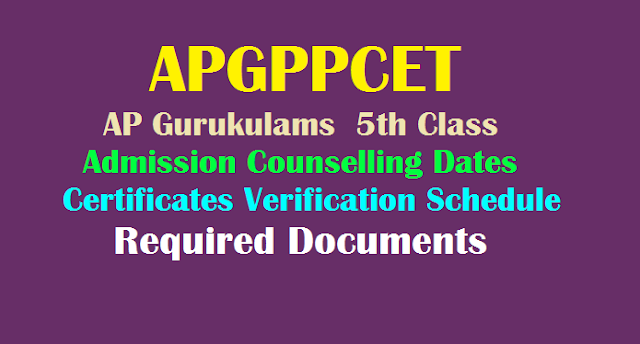 APGPPCET AP Gurukulam CET 5th Class Admission Counselling Dates Results Fifth Entrance Test Certificates Verification Schedule Required Certificates for Document Verification in AP GPCET Counselling :: AP GPCET 5th Admission Counselling Dates 2019 AP Gurukulam Certificate verification Schedule: AP Gurukulam 5th Class Certificate verification Dates 2019 and AP Residential 5th Class Admission Counselling Schedule at apgpcet.apcfss.in. AP GPCET Results announced on 29-03-2019 APSWREIS/ APTWREI 5th Class Counselling Dates, AP GPCET 5th Class Admissions required Certificates 2019. Andhra Pradesh Gurukula Patasalala Common Entrance Test-2019 Certificate verification Dates, AP GPCET 2019 V Class Admission in APSW / APTW / MJPAPBCW Residential Schools Counselling Dates 2019-2020. AP GPCET V Class Exam Counselling Dates, Selection Candidates list 2019 download. AP Residential School Educational Institutions Society has given APSWREIS 5th Class Admission Test 2019. How to Download APSWREIS 5th Class Counselling Dates and AP Certificate verification Schedule here. Click on the AP GPCET V Class Results Admission Counselling Dates link. Counselling Dates web psge will be displayed. Counselling Dates will be appear on the screen. Download/ take the printout of Counselling Dates for further use. Caste Certificate (if they belong to BC/ SC/ ST Category). 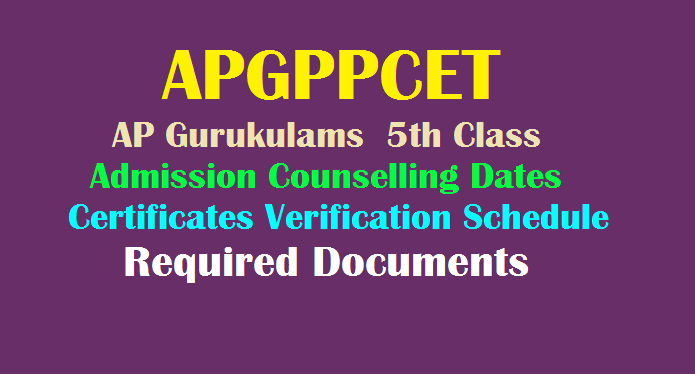 AP GPCET 5th Class Counselling Dates Download 2019 @ sgpcet.apcfss.in.- AP Residential CET 5th Class Certificate verification Schedule for Gurukula Patasala Admissions 2019.